Once Clay County’s center of economic activity, Cambridge developed in the early 1870s. By 1875 a post office was granted and the following year the U.S. Army installed a telegraph office here. 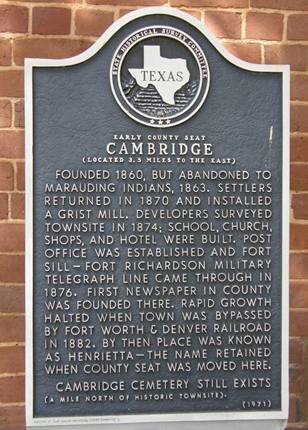 In July of 1882 the Fort Worth and Denver Railway chose Henrietta over Cambridge and the all-too-familiar story, citizens and businesses moved to the new county seat. 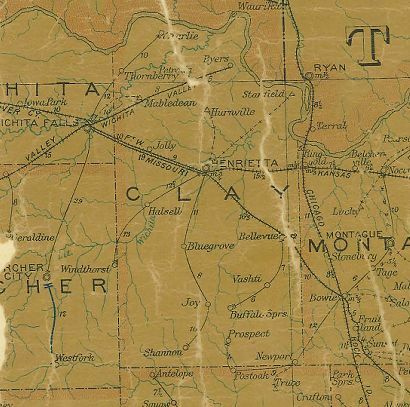 Cambrige’s last chance came and went when the Missouri, Kansas and Texas (KATY) Railroad decided to cross the tracks of the FW&D at Henrietta. Only the cemetery remains to mark what was once a prosperous town with limitless horizons. Founded 1860, but abandoned to marauding Indians, 1863. Settlers returned in 1870 and installed a grist mill. Developers surveyed townsite in 1874; school, church, shops, and hotel were built. Post office was established and Fort Sill-Fort Richardson military telegraph line came through in 1876. First newspaper in county was founded there. Rapid growth halted when town was bypassed by Fort Worth and Denver Railroad in 1882. By then place was known as Henrietta -- the name retained when county seat was moved here. 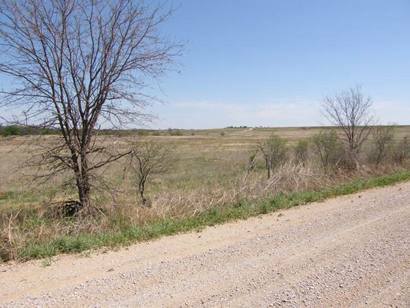 Cambridge Cemetery still exists (a mile north of historic townsite).